A link to your personal fairy and her helpful tips for family friendly dinners and entertaining ideas. Yesterday, I gifted a friend with lunch from my favorite Cajun restaurant, to help her get labor started on her third, overdue baby. While I know this is an unproven, old wives tale, the voodoo crawfish worked to bring about many local babies! Well, after ordering and coordinating delivery, I was left sitting at my desk craving Cajun food. I called my husband to whine about wanting to go out to dinner, but got no sympathy, so I took matters into my own hands! 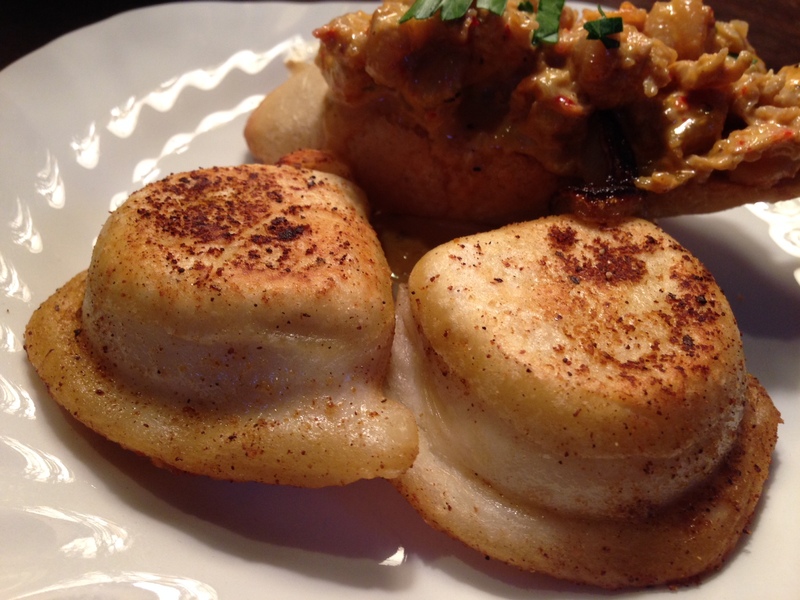 I shopped Pinterest for a Cajun pierogi recipe because I wanted to emulate the ones from High Street Caffe, but the recipes I found did not match the dish I desired. This is when the creative juices started to boil in my brain. By the time I left work, I was on a mission to go to Wegman’s and secure some super tasty crawfish!!!!! After an inspired trip to the store, I got home and started to cook! No pizza in my house on this given Friday! Once it was ready, I called my husband and urged him to rush home, because I couldn’t wait to dig in. It was HEAVENLY! Paired with a nice bottle of wine, it felt like a date at home! This recipe has now earned a spot in my top 3 greatest of all time!!! 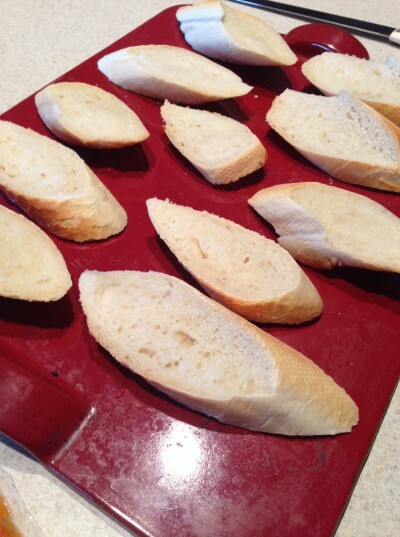 Slice the baguette diagonally to create large oval slices. Melt the butter in a skillet and add the minced garlic. Sautee for 1-2 minutes to infuse the garlic flavor. Place each slice on a baking sheet, the brush with the garlic butter. Bake at 450° for about 3 minutes, then flip to toast the other side. Remove from the oven, and set aside. In the same skillet used above, saute the garlic, mirepoix, and butter until softened. 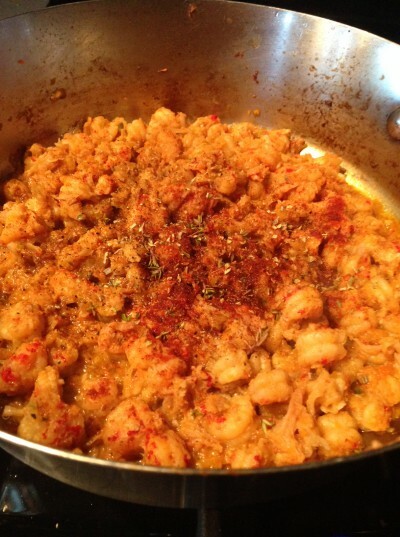 Add the crawfish tails and cook on high heat until firm. Mix in the spices, and saute for another minute. Add cream, mix well, and simmer uncovered for about 5 -10 minutes until thickened. Stir in the fresh parsley. 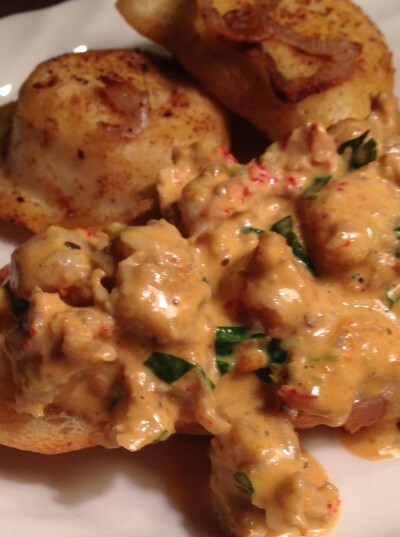 Place a slice of toast on a plate & spoon a generous serving of the crawfish onto the toast. Serve immediately. If you would like to serve this as a small appetizer, use smaller, coin sized slices of baguette and smaller portions of crawfish. 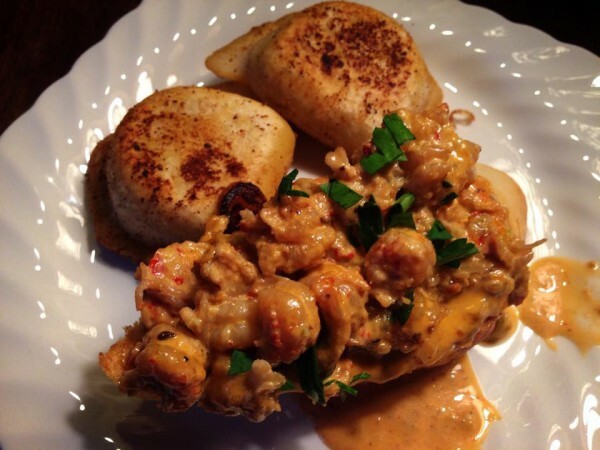 This pairs to well with Cajun pierogies! This is a total cheater recipe, so anyone can easily whip these suckers up. They also make a great stand-alone appetizer! Trusting the Internet: Should I really soak my feet in mouthwash? Pulling off Easter Dinner– A few tips to keep it simple.